Baby Milk Action sends condolences to the family of Helmut Maucher, (Nestlé CEO from 1981 – 1997). However, while he is being praised as a strong and visionary leader, its important we not forget the harm he caused to so many children over so many years. Maucher presided over Nestlé following the adoption of the International Code of Marketing of Breastmilk Substitutes in 1981, and set the company’s policy of refusal to abide by the minimum marketing requirements set by the World Health Assembly. Nestlé’s response to accusations with public relations coverups, started with Maucher (see Save the Children in China story below) and persists today. Nestlé still pretends to be code compliant (when it clearly is not) and suggests that more trust and ‘partnership’ is the answer. Here are a few excerpts from the Baby Milk Action Archives which we will be adding to. 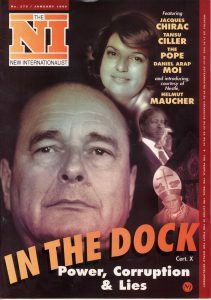 Nestle in the Dock: the New Internationalist is the groundbreaking development magazine that ran one of the earliest exposes of Nestle (1973 issue 006), In January 1996 (issue 275) it featured a fictional ‘World People’s Court’ in which public figures were accused of crimes against humanity. Nestlé’s Chief Executive, Helmut Maucher, was one of the six people singled out for trial. Here’s an excerpt from Boycott news 19, August 1996, which includes a Financial Times article (8.7.96) “Charity asks Beijing to probe baby milk allegations” by William Lewis. It describes Save the Children’s battle with Nestlé over its marketing in Kunming, China. CLICK HERE STC is quoted as saying: “Nestlé are currently aiding and abetting the wholesale breach of the International Code by inappropriate selling and distribution policies.” Michael Aaronson, Director General of Save the Children at the time, goes further: “as a result of the company’s marketing activities in Kunming, “the use of formula in hospitals is now widespread. There has been a decrease in the incidence of breastfeeding and a large increase in the consumption of Lactogen.” Maucher, then Nestlé’s Chairman, ordered an investigation of the facts. STC responded questioning the independence of the team of investigators, saying: “… far from resolving the misgivings” the report added to the charity’s original concerns. Nestlé described the charity’s campaign as a “barren pursuit”. Ethics and democracy were two key issues at the Nestlé Shareholder meeting in Lausanne in April. Over 2000 shareholders were present and, in front of US TV cameras, Nestlé was on best behaviour – friendly with everyone – publicly welcoming the news on breastfeeding (See Update 29). Unlike smaller companies, where shareholders are at least able to get resolutions put on the agenda, £147.5m is needed to do this with Nestlé. Nestlé’s refusal to turn up at the EU Parliamentary Hearing illustrates further its lack of respect for democratic procedures (see below). IBFAN has attended the AGM since the early 90’s when non-Swiss were allowed to own shares after Nestlé bought Rowntree. At this years AGM, Patti Rundall of Baby Milk Action asked the new CEO, Peter Brabeck, a number of questions, including his views on ethics. Does a low-income mother count as a ‘stakeholder’ or a ‘responsiblity’ for Nestlé?